Nigeria Air is a failure of communication and strategy for now..
Every formal business start with an idea, then idea is legalised ie incorporated, funded and implemented. At what stage Nigeria Air? Idea? not really we hear of talks with Boeing and investors? Incorporation? well there is a name and logo but does Nigerian Air have a CAC RC number? Implementation? of what? the idea? 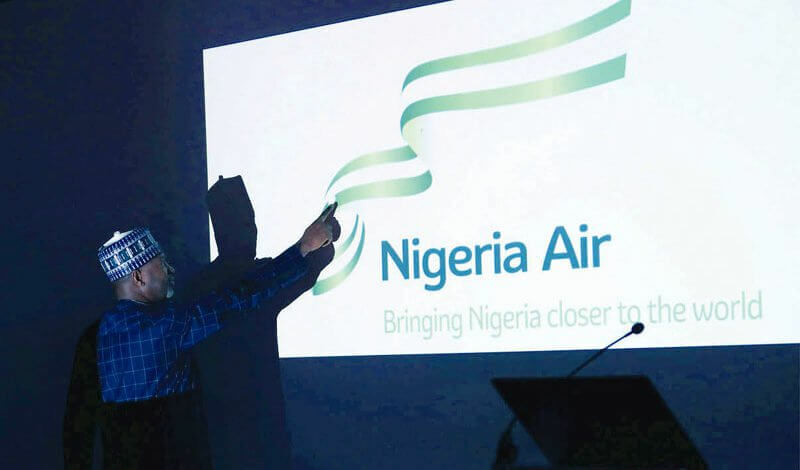 The only official information we have about Nigeria Air is her logo…the talk about $300m etc are all second hand information, We simply have not been fully briefed. We understand a regulatory body had mandated the FGN can only own 5% of the new airline…..is this 5% to Federation or Federal Government? can States invest? can the Pension Fund of the NNPC invest? is NNPC Government? If I am am Investor….say 51% investor, and I don’t like the name and logo, can I change it? No? even if I own 51%? and you own just 5%? so who should have chosen a name and logo? the minority 5% owner? Where will this company be licensed? in Nigeria or London? if its registered in Nigeria, will it be subject to paying expensive insurance? if its registered in London with majority foreign investors, how is it a flag carrier? Why is the FGN investing a kobo in this airline? did the FGN invest a kobo in any GSM company? MTN did not invest to help Nigeria, it invested to make money…i doubt there is any airline in the world that will pass up the chance to profit from the Lagos to London route…its very profitable, so why is the Nigerian Government paying an investor to invest in a profitable route? Who will determine the routes? The 5% minority owners? If for instance Sokoto is not a profitable route, will Nigeria be mandated to fly there? the Minister said Nigeria Air will fly 41 international routes, in addition to 81 domestic and 40 regional, how does he know this? what if the investors want to do only 5 domestic routes? they own the airline remember.. These questions probably have comprehensive detailed answers but if they are not shared, then the Minister of Aviation is simply winking in the dark. The Nigerian Government had not made a secret of her desire to have a national airline…but has communicated very few details. The Federal Government should attract investors and midwife a new Airline yes….but should not be on the “business” of paying for logos and selecting names……and routes, unless the plan is for Nigeria to own the airline.